We are proud to announce that we are now sponsors of Paracyclist Katie Toft. As part of our ongoing initiative to support local athletes in the area, having already pledged our support to British Superbike rider Christian Iddon and Trials rider Hannah Styles, we are pleased to support Katie who is from High Peak. For those of you who are unfamiliar with Katie’s exploits, she is a World Championship Gold-winning Paracyclist who has cerebral palsy. Katie began cycling with Stockport CP Wheelers and has since been cycling competitively for around 5 years. 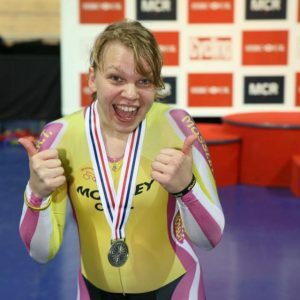 She continues to impress on the world stage and having seen the effects that a brain injury can have on an individual and their family, we as a firm feel compelled to support Katie in her ambition to reach the highest possible level in her sport. With our continued support and Katie’s hard work and dedication, we look forward to seeing what next year’s cycling season has in store.